BBQ Bacon Wrapped Chicken uses only four ingredients to make the most amazing sticky, sweet, and savory chicken recipe. 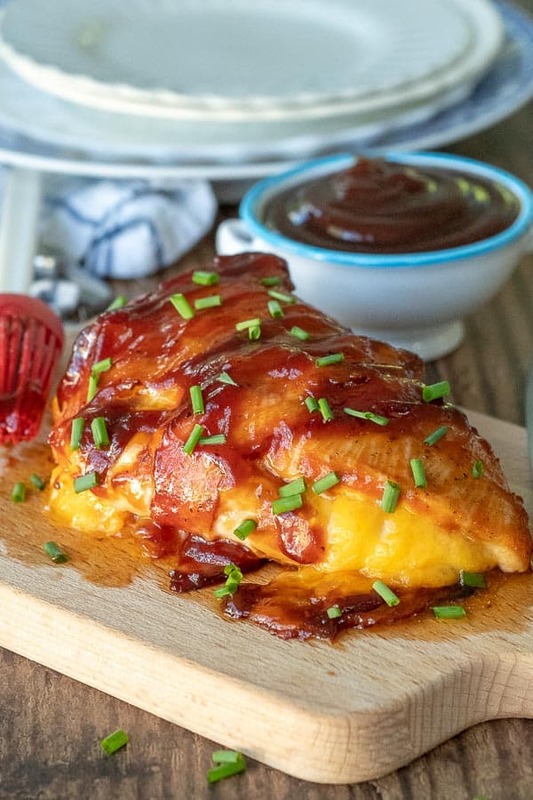 Oven baked chicken breasts are stuffed with oozing melted cheddar cheese, wrapped in crispy bacon, smothered in BBQ sauce. When it comes to recipes that only use a few ingredients, I can be a skeptic. How can something that simple taste good?? 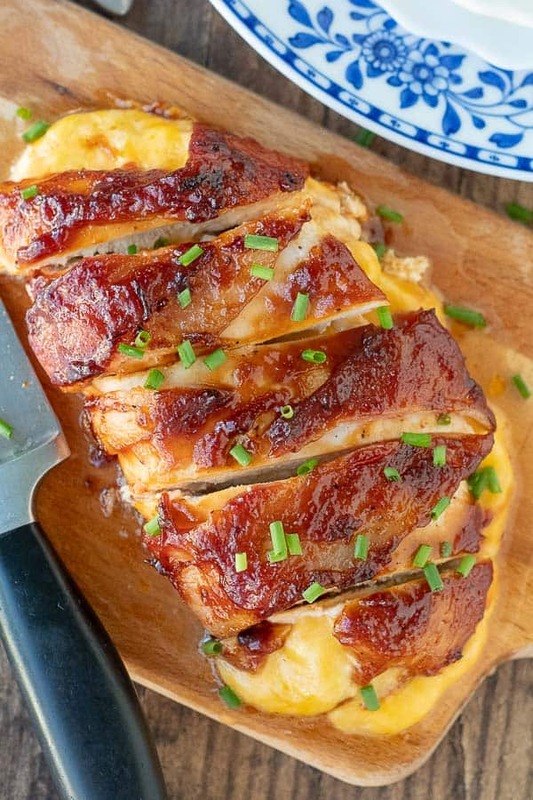 However, if the perfect flavors are melded together, like sticky BBQ, juicy chicken, crispy bacon, and creamy melted cheese, nothing else is required to make a perfectly divine recipe. A lot of bacon wrapped chicken recipes fall short because baking bacon and chicken breasts properly requires two different oven temperatures and cooking times. Therefore, wrapping bacon around chicken, throwing it in the oven, and hoping for the best is bound to yield some disappointing results. Either the chicken will be dry and overcooked or bacon will be limp and unappealing. For this BBQ Bacon Wrapped Chicken recipe, the bacon is cooked partially at a higher temperature before wrapping it around the chicken. When it’s time to bake, the chicken comes out of the oven perfectly moist with crispy bacon wrapped around it. Partially bake bacon on a foil-lined baking sheet at 400ºF. Remove bacon from oven and lower temperature to 375ºF. 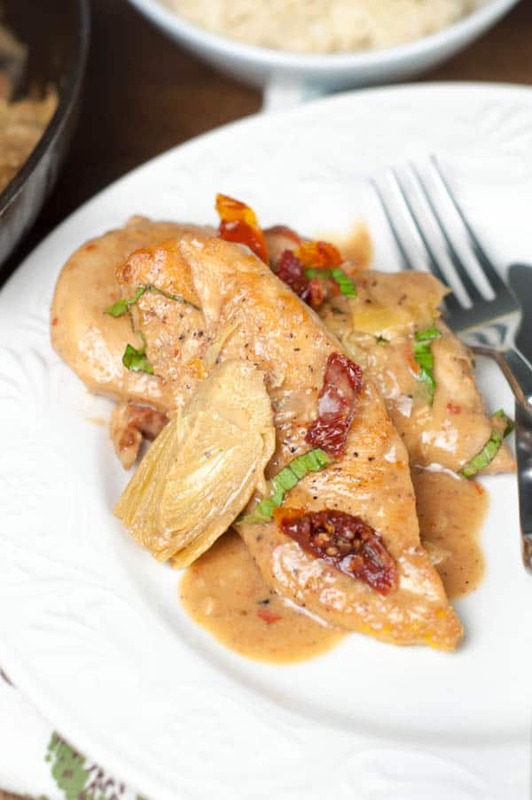 Wrap partially cooked bacon around cheese stuffed chicken breasts and bake for 25-30 minutes or until chicken reaches a temperature of 160ºF. What About Those Extra Crispy Bacon Fans? I hear you loud and clear because you’re preaching to the choir! If you prefer extra crispy bacon, increase the pre-baking time to 11-12 minutes. Just make sure bacon is still flexible enough to wrap around chicken. Also the chicken can be broiled for a couple minutes at the end, but watch very carefully. BBQ sauce can burn quickly because of the sugar. Butterfly and season chicken breasts. To butterfly chicken breasts make a deep slit in the middle of the breast, lengthwise. Cut all the way across until you almost reach other side, so it will open like a book. Partially bake bacon on a foil-lined baking sheet at 400ºF. Remove bacon from oven and lower temperature to 375ºF. 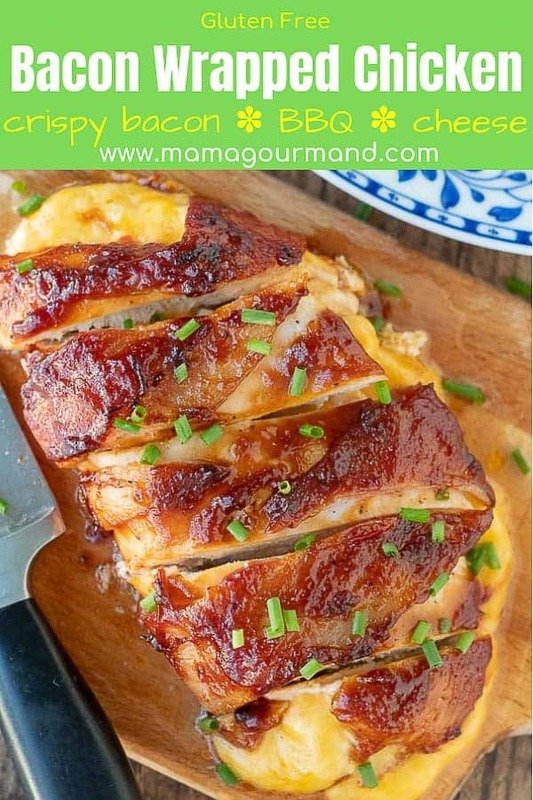 Place shredded cheddar cheese in the pocket of each chicken breast. Wrap 2 pieces of bacon around the chicken and brush on BBQ sauce. Bake for 25-30 minutes, basting chicken with more BBQ sauce halfway through. Try out different cheeses for stuffing chicken breasts – pepper jack, Colby, chive cream cheese, sharp cheddar or swiss. If you prefer extra crispy bacon, increase the pre-baking time to 8-9 minutes. Just make sure bacon is still flexible enough to wrap around chicken. The chicken can also be broiled at the very end to make bacon crispier. However, watch very carefully because BBQ sauce can burn quick! To lighten this recipe, omit the cheese. It will still taste fantastic! Baste chicken with more BBQ sauce halfway through baking to layer on more flavor. 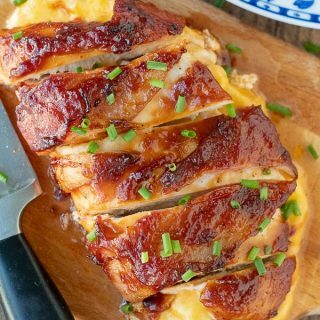 SAVE THIS BBQ BACON WRAPPED CHICKEN TO YOUR PINTEREST BOARD! 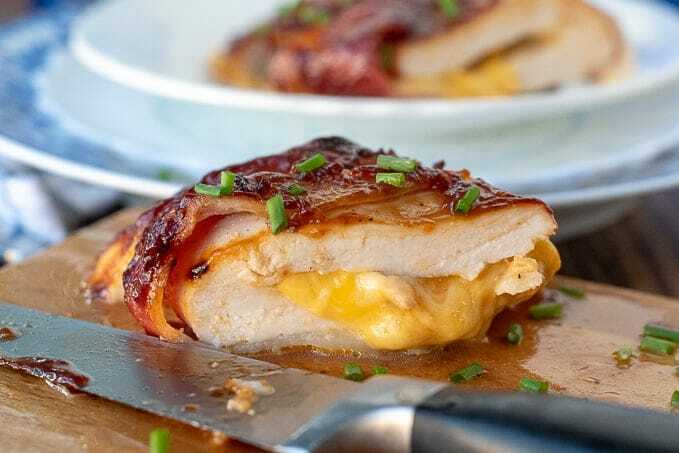 BBQ Bacon Wrapped Chicken uses 4 ingredients to make BBQ oven baked chicken breasts stuffed with melted cheddar cheese and wrapped in crispy bacon. Preheat oven to 400ºF. Line a baking sheet with foil and lay 8 slices of bacon on foil. Bake bacon 10-12 minutes, depending on how crispy you like your bacon at the end. Remove partially cooked bacon from oven. Turn down oven to 375ºF. Butterfly chicken breasts by starting at the thicker end and cutting through the middle, being careful to not cut all the way through. The chicken will be able to open like a book or butterfly with 2 thinner sides. Place 1/2 cup cheese on one side of chicken and then fold the top over it. Season the top of closed chicken with salt and pepper. Move bacon to one side of the baking sheet. Transfer stuffed chicken breasts to baking sheet. Lay the pieces of bacon over the top of each chicken breast, wrapping bacon around and tucking ends underneath. Brush on part of the BBQ sauce all over top and sides. Bake for 15 minutes. Remove from oven and baste with more BBQ sauce. Bake for 10-15 minutes more, or until chicken reaches an internal temperature of 160ºF. To make bacon crispier broil 1-2 minutes. the because BBQ sauce can burn quick! Could you use smoked Gouda cheese? Oh my gosh do I LOVE smoked gouda cheese. You can definitely use it, but it doesn’t quite melt the same. It would still be delicious though! 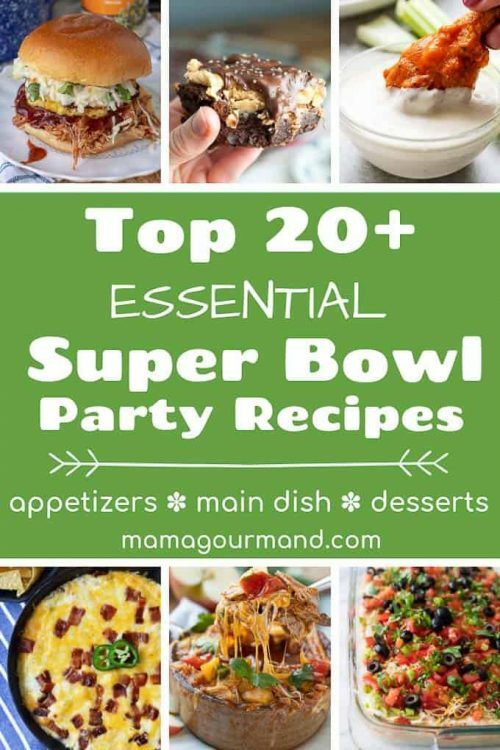 Made this last week, was a big hit and SO easy! Delicious!!! Cant wait to try the cilantro lime chicken you recently posted!!! Thank you!!! Wow! it looks so delicious! I’ll make it this weekend. Thank you so much! We are having it again this weekend for dinner. 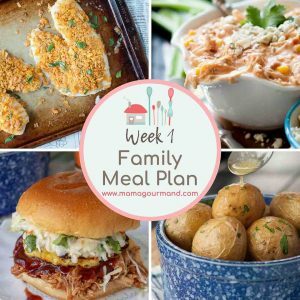 The kids love this dinner!